Do you know any students who love trivia? Have quick reflexes? 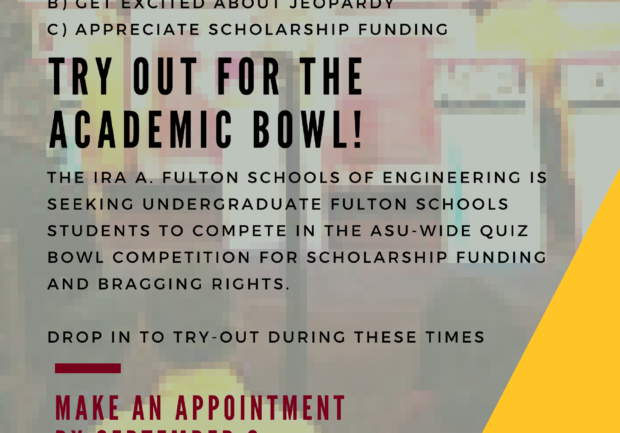 Interested in competing in quiz bowl competitions? 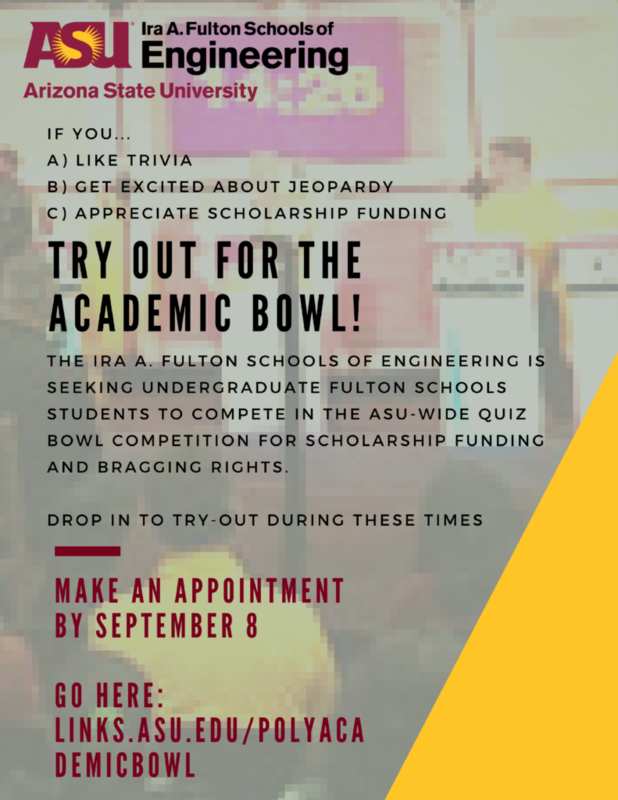 The Ira A. Fulton Schools of Engineering is seeking undergraduate Fulton Schools students to compete in the ASU-wide quiz bowl competition for scholarship funding and bragging rights. The Academic Bowl pits college teams against each other in a fast-paced round of trivia that covers everything from political science to pop culture. The Fulton Schools will field two teams of four plus alternates. The teams are currently looking for six new team members. To audition for a team, a student must be a full-time Fulton Schools undergraduate student in good academic standing. Tryouts consist of completing a 100-question quiz in the most efficient time possible. Tryouts are graded on a weighted points scale based on time taken to complete the test and the number of correct answers, unanswered questions and incorrect answers. Also, students must remember to bring their pen and paper! Polytechnic campus-based students are welcome to schedule an appointment with Jesús Chaves for tryouts. Questions? Contact Cortney Loui at cortney.loui@asu.edu.